SACACOMIE, Quebec – It took me a while to understand why Volkswagen Canada had invited journalists and members of the media to Sacacomie Hotel, in Quebec. We were proposed a drive on a frozen lake, followed by a casual country road trip. At first glance, the whole program seemed like the people at Volkswagen had decided to go on vacation and invited journalists along the way at the last minute. What the heck were we doing there anywhere? What Volkswagen wanted to tell us in Sacacomie was that it nearly doubled its sales of all-wheel-drive vehicles in 2017. And not just SUVs, but cars as well! So, for the event, the carmaker had set up a variety of exercises for us to sample its system. 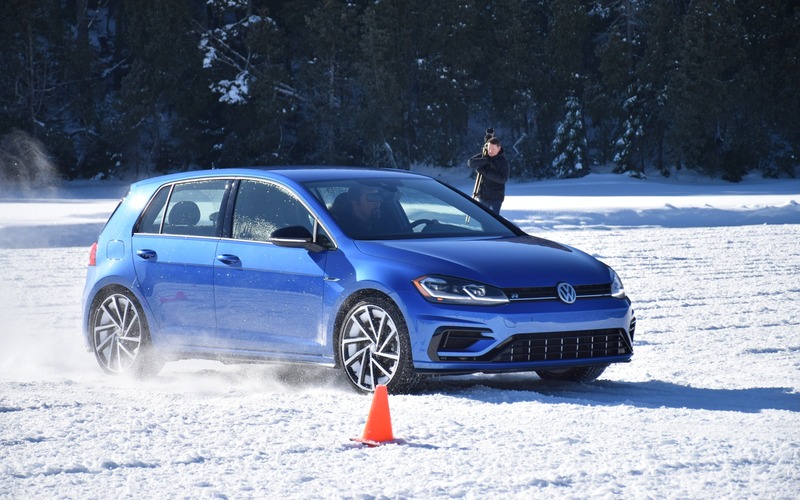 On the road, and on a frozen lake, we were offered the chance to drive Volkswagen’s entire 4MOTION lineup—the Tiguan, the Atlas, the Golf Alltrack and the Golf R. Before heading out in the open, Volkswagen took the time to explain to us a few interesting facts about its system and its importance to Canadian consumers. In recent years, there’s been a rise in popularity in all-wheel-drive vehicles in Canada. Volkswagen claims that except for some slight changes in traction control settings, the 4MOTION system is identical from one model to the next, whether it’s installed on a high-performance hot hatch such as the Golf R, or a compact crossover like the Tiguan. 4MOTION is first and foremost a front-wheel biased system, which sends power to the rear wheels when slippage is detected. Fun fact: the system can send almost 100% of available power to the rear wheels. Furthermore, power isn’t only transferred when the front wheels lose grip, but also when an overabundance of torque is detected, making it ideal for high-performance driving as well. 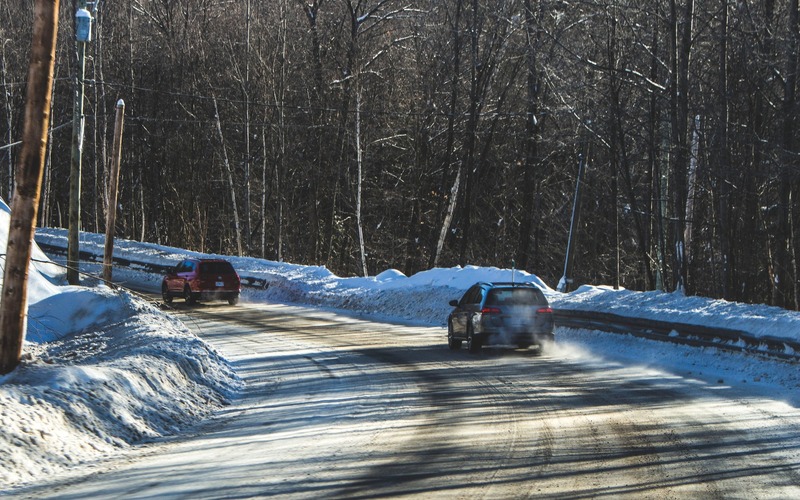 The first section of the program consisted of driving the cars on the sinuous roads of the Mauricie region. Not particularly exotic for a Québécois such as myself. At least, my colleagues from British Columbia seemed to enjoy it! During the drive, we had the chance to alternate between the Tiguan, the Atlas and the Golf Alltrack with a manual gearbox. Thanks to its lower centre of gravity and carlike driving dynamics, the Alltrack was by far the most capable vehicle on snowy roads. The Atlas, on the other hand, proved to be impressively agile in these conditions, even with its much higher curb weight, but we had to modulate the throttle in these slippery conditions if we wanted to follow the Golf. What impressed me most was that even though all these vehicles ride on the same platform and utilize the same all-wheel-drive system, each of them feels like a totally unique vehicle. The second section, which was by far the most enjoyable, consisted of driving the vehicles on a frozen lake. With 66 cm of thick ice and a good abundance of snow underneath our feet, the conditions were absolutely perfect. Anyway, the experience itself was, again, quite revealing as to how each vehicle behaves in these extreme conditions. 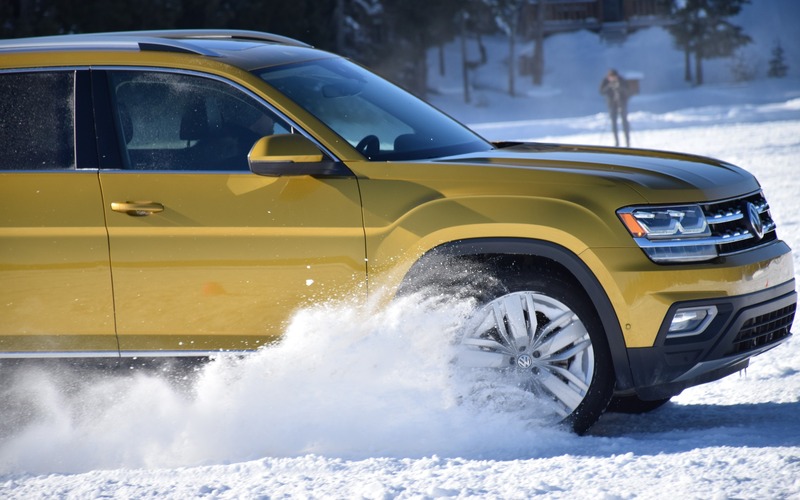 The Atlas and the Tiguan did allow us a bit of sideways action, but their traction control systems quickly kicked in, preventing us from performing real drift manoeuvres. To my surprise, the Golf R was a bit clumsy out there on the ice. Its short wheelbase, overabundance of power and wide tires meant it was harder to keep a steady, controlled skid, which quickly resulted in spinouts. Again, it was the Golf Alltrack that proved to be the most capable out there in the open. Thanks to the fact that its traction control system can be entirely removed, its long wheelbase, its thinner tires and just the right amount of power from its turbocharged 1.8-litre four, the little German wagon weaved its way through the cones as if it was built for the occasion. It’s an absolutely brilliant car. So, what exactly did we learn from our experience in Sacacomie? That Volkswagen had some money to spare to go play in the snow? Not exactly. Jokes aside, advanced winter driving programs such as these are always a great way to properly sample the different AWD systems currently available. With so much variety out there, it can get rather confusing for consumers. That being said, Volkswagen’s 4MOTION is a highly competent system that’s well suited for our winters, all while offering enough flexibility for different types of applications. But if you want my honest opinion, I’d say it’s useless to buy a crossover. Volkswagen well sell you little wagon it calls the Golf Alltrack. It comes with either a manual or an automatic transmission. And it can do everything an SUV can, only better.